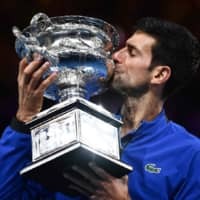 MELBOURNE, AUSTRALIA - Novak Djokovic has designs on matching Roger Federer’s record of 20 Grand Slam titles after completing a record-breaking Australian Open victory. In a breathtakingly mistake-free performance that yielded a remarkably lopsided result, the No. 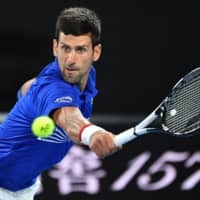 1-ranked Djokovic overwhelmed Rafael Nadal 6-3, 6-2, 6-3 on Sunday night to win a record seventh Australian Open championship and a third consecutive Grand Slam title, raising his count to 15 overall. The Serbian said he was motivated to “have a shot” at Federer’s record, but conceded that it was “still far” away. “I am aware that making history of the sport that I truly love is something special. Of course, it motivates me,” he told reporters after celebrating the demolition of his greatest rival in their 53rd meeting. “Playing Grand Slams, (the) biggest ATP events, is my utmost priority,” Djokovic added. It was the manner of victory that had many, including Djokovic, believing he can go on to match, or possibly overtake, Federer. At 31, six years younger than Federer, he has time on his side. “I do want to definitely focus myself on continuing to improve my game and maintaining the overall well-being that I have — mental, physical, emotional — so I would be able to compete at such a high level for the years to come, and have a shot at eventually getting closer to Roger’s record,” Djokovic said. Djokovic left Nadal smirking or gritting his teeth or punching his racket strings, unable to compete at all during the final. Here’s how Nadal explained it: To have a chance when Djokovic plays that well, something extra is required. Given that he’s coming off a series of injuries and hadn’t played since the U.S. Open last September, Nadal couldn’t raise his game. Djokovic added to previous triumphs in Melbourne in 2008, 2011, 2012, 2013, 2015 and 2016, along with four titles at Wimbledon, three at the U.S. Open and one at the French Open. He broke his tie with Federer and Roy Emerson for most Australian Open men’s titles. He also broke a tie with his idol, Pete Sampras, for the third-most Grand Slam trophies; Djokovic now only trails Federer and Nadal, who has 17. Djokovic’s victory on Sunday was simply magnificent as he dominated Nadal in 124 minutes of spellbinding tennis. Nadal entered the match having not dropped serve since the first round of the tournament. Djokovic broke the world No. 2 twice in each of the three sets and lost only 13 points on his own serve while delivering eight aces. He committed just nine unforced errors. The numbers were scarcely believable considering the duo had battled for almost six hours in their previous meeting in the Australian Open final in 2012 — the longest final in Grand Slam history. “Under the circumstances, playing against Nadal, such an important match, yeah, I mean, it’s amazing,” said Djokovic. Djokovic will go to Paris in May for the French Open seeking to become the only man in the Open Era to win all four majors twice. A victory would also leave him holding all four major title at the same time for the second time in his career. But Roland Garros is where the “King of Clay” Nadal rules, having won 11 French Opens in 13 years. 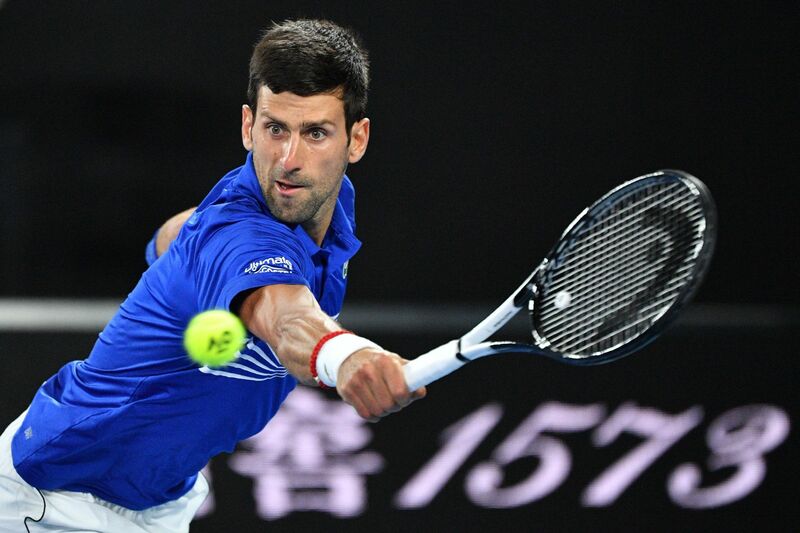 Djokovic would love to dethrone the Spaniard there after humiliating him in Melbourne. “Obviously I have to work on my game, my clay-court game, a bit more, more specifically than I have,” said Djokovic.